I wasn’t expecting to run into a gas station taco stop while test driving a Kia K900 at the dad blogger conference Dad 2.0 Summit, but I’m always checking whenever I pass a gas station. 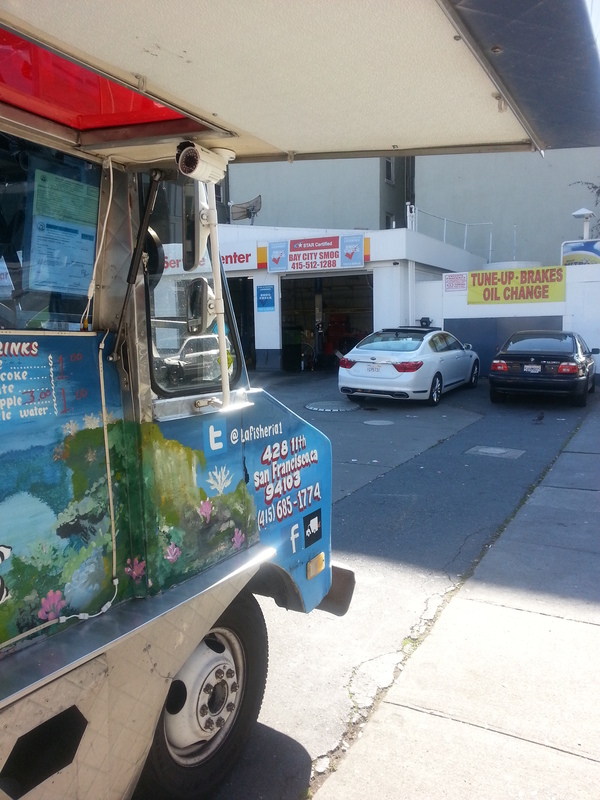 There it was a taco truck, under a Shell gas station sign on a Friday afternoon in the San Francisco sun. La Fisheria is a typical California taco truck focusing mainly on seafood, which typically means the toppings are cabbage and avocado instead of cilantro and onions. That is the case here, which is unfortunate since that combo goes great with seafood, but it is not a great pairing when chicken, beef and pastor are also offered on the menu. They also offer a veggie taco too. Topping for all tacos are cabbage, pico de gallo, avocado and chipotle sauce. The focus here is seafood tacos where one can choose from shrimp tilapia, snapper and salmon. They all include grilled pepper along with the toppings already mentioned. I decided to order beef, pastor, and tilapia tacos. I asked for the avocado and chipotle sauce on the side. Since I needed to get the car I was testing back to the hotel, I asked for everything to go. 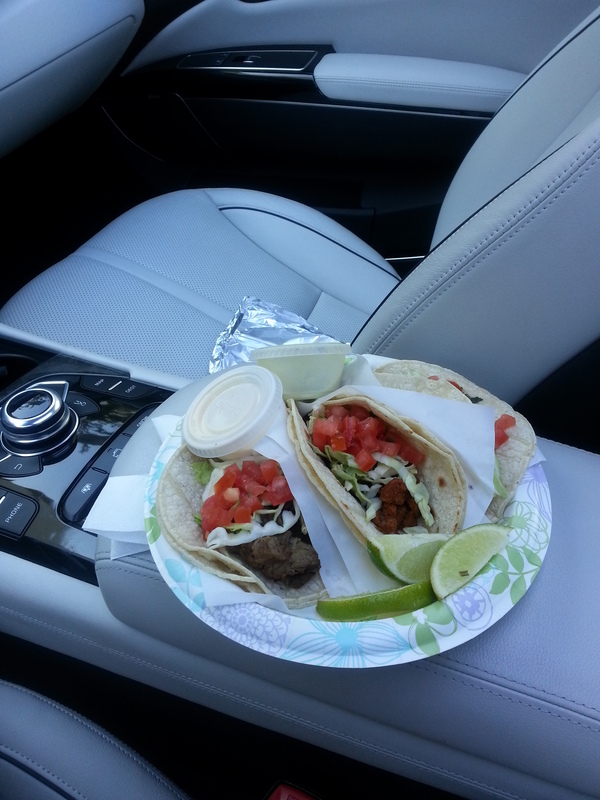 As much as I wanted to eat the tacos right in the car, I decided to respect the beautifully crafted interior of a $60,000 plus Kia. Yes that’s right a $60,000 Kia! When I arrived back at the hotel, the Kia crew was enjoying my quick gas station taco stop. I exited the car with my to-go plate and headed into the hotel to enjoy my unexpected finding. Sadly the tortillas were store bought corn tortillas that were simply pulled from the package in their dry, flavorless state. Hopefully the meats and fish would save the tortilla situation. I started with the tilapia. Well I think did. It was hard finding any fish in the taco. There were maybe four small chunks of fish surrounded by a lot of grilled peppers, cabbage and pico de gallo. I poured on some avocado sauce to improve the bland flavor. Sadly that didn’t help much and with the fish taco being a total fail, a depressing sign for a taco truck featuring seafood tacos, I wasn’t too excited to try the beef and pastor. The beef was flavorless with no seasoning not even salt and pepper from what I could tell and definitely no marinade. The chipotle sauce did help it a little as it lacked flavor without the help of the sauce. Unfortunately, the meat was chewy and I was done after a few bites. Finally the pork pastor taco would hopefully save the sorrow of this lunch. At least there was an attempt of flavoring the pork, but like the other two tacos there was a lot left to be desired. It was quite possibly the worst pastor taco I’ve ever had. Everything here was a fail. So while it was fun seeing a gas station taco option in San Francisco, it was one I can’t recommend nor will stop at again. I should’ve just kept driving the Kia a little longer instead of making a quick stop. Just your average guy looking for the perfect street taco in a gas station now that food trucks now have twitter accounts, facebook pages, and $5,000 worth of vehicle marketing wrap.